This calculator will find the missing variable in the physics equation for force (F = M * a), when two of the variables are known. Newton's second law states that force is proportional to what is required for an object of constant mass to change its velocity. This is equal to that object's mass multiplied by its acceleration. We use Newtons, kilograms, and meters per second squared as our default units, although any appropriate units for mass (grams, ounces, etc.) or velocity (miles per hour per second, millimeters per second2, etc.) could certainly be used as well - the calculation is the same regardless. 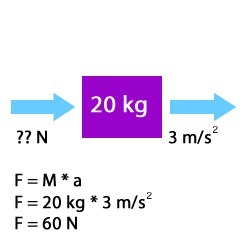 What is the force required to accelerate an object with a mass of 20 kg from stationary to 3 m/s2? Newtons are a derived unit, equal to 1 kg-m/s². In other words, a single Newton is equal to the force needed to accelerate one kilogram one meter per second squared. Furey, Edward "Force Calculator F = ma"; from https://www.calculatorsoup.com - Online Calculator Resource.